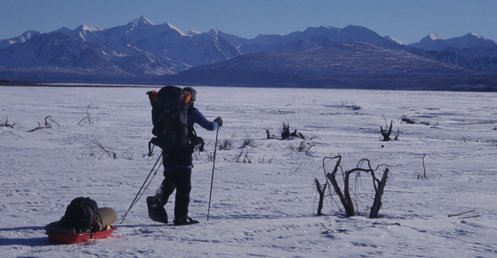 In Feb 2003 the 3 man DMX logistic support team trialled the latest Yowie snowshoes whilst on a winter expedition to the Denali National Park, Alaska. The snowshoes were used in a wide variety of snow and ice conditions, over varying terrain and in temperatures ranging from +5°C to -40°C. They performed outstandingly throughout the expedition and attracted very favourable comments from all the team members. Straps Initially the system looked complicated but once mastered they were very quick and easy to put on. The strap system proved to be extremely secure, even when crossing the roughest and steepest terrain. We encountered no problems with the straps freezing or jamming, despite the fact that the snowshoes were on several occasions immersed in river meltwater and then exposed to sub zero temperatures. 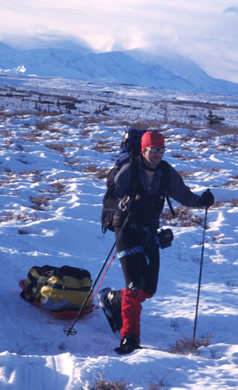 The strap system was also very versatile, allowing us to attach the snowshoes to a wide variety of footwear ranging from heavy plastic telemark ski boots at one extreme to lightweight approach shoes at the other extreme. Soles and grip The hexagonal pattern on the soles of the shoes combined with the metal "teeth", provided a remarkable amount of grip, both on sheet ice and steep snow covered slopes. We found ourselves still using the shoes in conditions where one would normally expect to resort to crampons. "Yowies have completely changed my opinion of snowshoes. In the past I have always regarded snowshoes as a heavy, cumbersome, and rather inelegant way of getting around on snow that should only be used by those who have failed to master the art of skiing. However, our Yowies were so light and flexible that we hardly knew that we had them on our feet. They enabled us to move quickly and efficiently across a far wider variety of terrain than we could have ever done on skis alone. Despite their lightweight construction they proved to be incredibly tough and withstood a tremendous amount of abuse from the harsh Alaskan tundra. "I would have no hesitation in recommending them to any expedition." Please be reassured that I did not hold back on any negative criticism. The only concern or question mark over their performance I really had was how effective they would have been in deep powder snow compared to more traditional snowshoes with a larger footprint. As mentioned in my report we never got a chance to see how they would perform under those circumstances. However, from my perspective any deficiencies there might be in the above respect would be more than compensated for by their lightweight. Normal snow shoes are so heavy that I would normally only consider taking either snowshoes or skis on a particular expedition, but never both. However, the Yowies were so light, flexible and easy to pack/carry that I would quite happily take both them and skis and use whatever was most suited to the conditions on any given day.